There are two types of people in this world: Those who charge their iPhone by attaching it to a computer via USB, and those who charge it by plugging it in to the wall. Neither feels especially elegant since you’re left with a meter worth of cable snaking around your kitchen counter or desk either way. 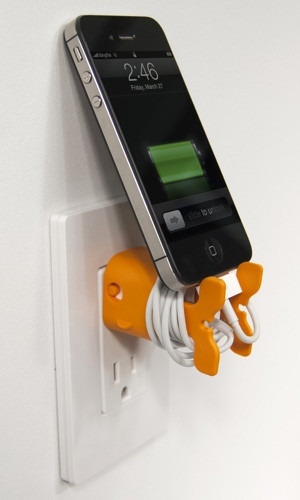 Design firm Nice has a clever little idea to keep your counters more organized and keep that charger cable tangle-free. It’s invented the Goldie, an adorable, fish-shaped plug holster that you can wrap your charging cable around when not in use. Having a place to wrap that extra length of cord comes in very handy. But if that’s not enough, you can also perch your phone on Goldie as it charges, reclaiming a little bit of working space. Just be careful your phone has a sturdy, protective case if you choose to balance it against your outlet – after all, you still need to keep it safe from getting knocked over by tiny, curious fingers or an inquisitive pet. You can purchase the Goldie cord organizer in the its orange or your choice of 4 other colors for $16.00 at nicebydesign.com. Nice also makes a similar item for your iPad charger cable called Nibbles, also available for $16.